I love how that sounds. Candy Cane Cowl. An alliteration lover’s dream. This past December I finally decided I needed to think less about designing something and actually do it. I’ve wanted to design SOMETHING for a while. I thought for my first written project I would keep it simple, go with something that didn’t involve shaping, and make a cowl, with stripes like a candy cane. 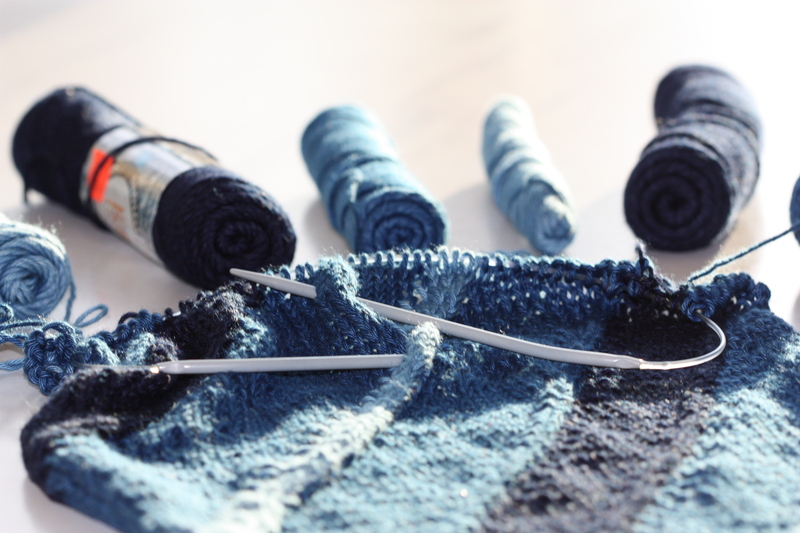 Why did I choose intarsia for my first project?!?! Maybe my subconscious thought I should learn to like it more. Maybe. Do I like it more? Not so much. But hey, it’s not that bad. I looked into my meager stash of yarns and found…da da da da…some Real Jeans indigo dyed cotton that had been hanging out in a plastic bin for probably about 10 years. I had 3 royal blue skeins, 2 dark blue and one light blue skein. My candy cane stripes were going to be of the blueberry flavour variety. 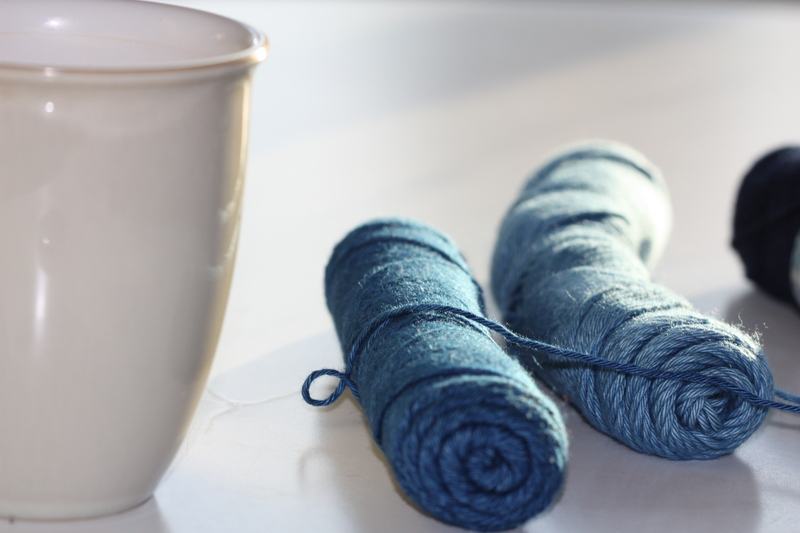 Using 4mm needles I cast on 58 stitches in the royal blue. 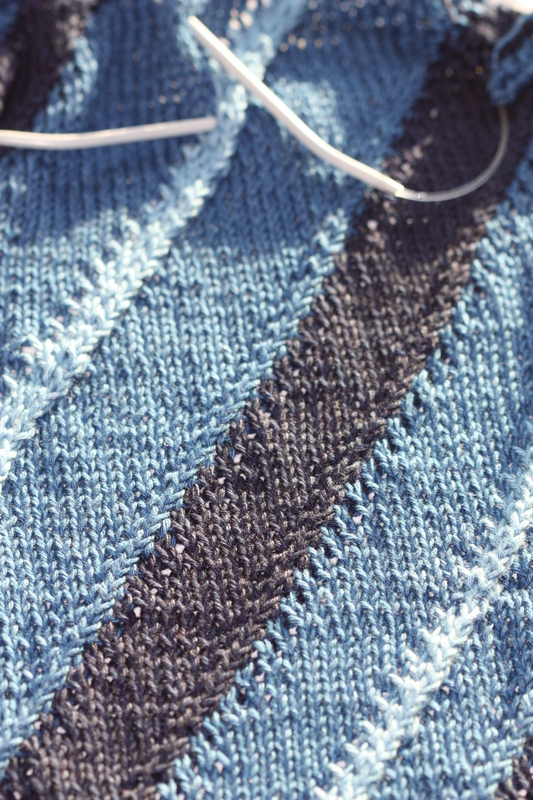 For the wrong side row I knit 2 (for a 2 stitch garter stitch edge), then purled 54 stitches and then knit the last 2. (I did this for every WS row.) Then I began my pattern. I knit (there was some cabling involved) the entire row in the following order 13 royal blue, 8 dark blue, 9 royal blue, 3 light blue, 9 royal blue, 9 dark blue, 6 royal blue. How I added cabling was through the first two stitches of almost all of the colour changes–just to make things a little more interesting. Then I continued the pattern and on the RS rows just offset each colour change by one, moving the diagonal stripe to the right. When I have time to figure out how to chart this I will. Not to make excuses (but I am totally going to) I am enrolled full-time in school, work one day a week and coach soccer for one of my kids. I’ve been a little busy. This entry was posted in Uncategorized and tagged Candy Cane Cowl on January 15, 2015 by Peachy.